← Sweatfree clothes @ UH Bookstore! The New York Times is reporting that ex St. John’s college dean and vice president Cecilia Chang has been charged by the Feds with forced labor and bribery. And just who was she forcing into labor? Students of course! 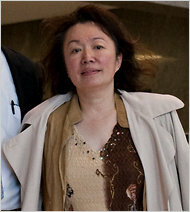 Chang threatened to cut the students scholarships if they didn’t perform extra duties like driving her son to the airport at 3 a.m. Magistrate Judge Joan M. Azrack set Ms. Chang’s bail at $1.5 million. We’ll spare you the jokes about a one of America’s leading Catholic Universities being embroiled in this scandal because lousy working conditions are nothing to wisecrack about. Here’s the complete story in PDF format: Ex Dean charged with forced labor NYT 9.30.2010 And here’s a link to the story on the Times’ website. Poor labor conditions and forced labor conditions are nothing to joke about. If you want to get involved in the fight against poor labor conditions, join forces with Sweat Free Houston we meet every first Sunday from 7-9 p.m. at 1303 Ruthven Street. That’s in Fourth Ward adjacent to Midtown. Give us a call at 832.771.7263 if you are ready to get involved or have any questions about our work. This entry was posted in crooked adminstrators, forced labor, sweat free houston and tagged Cecilia Chang, forced labor, Institute of Asian Studies, scholarships, St. John's, student labor. Bookmark the permalink.